We are happy to announce that our paper “Opportunities for Energy-Water Nexus management in the Middle East and North Africa”, has been accepted for publication by the academic journal Elementa: Science of the Anthropocene. This study was the result of collaboration between William N. Lubega (Illinois at Urbana-Champaign) and Prof. Amro M. Farid and William W. Hickman (Dartmouth). Electric power is required to produce, treat, distribute, and recycle water while water is required to generate and consume electricity. Naturally, this energy-water nexus is most evident in multi-utilities that provide electricity and water but still exists when the nexus has distinct organizations as owners and operators. Therefore, the sustainability question that arises from energy-water trade-offs and synergies is very much tied to the potential for economies of scope. Furthermore, in the Middle East and North Africa (MENA) region, multi-utilities are not only common, but also the nexus is particularly exacerbated by the high energy intensity of the water supply due to limited fresh water resources. Several accelerating trends are increasingly stressing the existing supply systems of MENA countries: Increased demand due to population and economic growth, a more extreme and unpredictable climate mostly affecting water supply and power demand, and multiple drivers for more electricity-intensive water and more water-intensive electricity including aging infrastructure and certain regulations and standards. This paper identifies and motivates several opportunities for enhanced integrated operations management and planning in the energy-water nexus in multi-utilities in the MENA. From the discussion of the coupling points between the energy and water systems and operations management strategies to optimize these coupling points, several policy implementations can be drawn. First, the existing approaches to dispatch of the individual products of power and water could be replaced by integrated energy-water dispatch. Second, existing fixed power and water purchase agreements can be replaced with a seamlessly integrated energy-water dispatch. As in liberalized power systems, multiple time horizon markets with their respective clearing mechanisms would be required so as to provide dynamic incentives for greater cost and resource efficiency. Fourth, the energy-water nexus also presents coupling points that engage the demand side of both power and water. Carefully designed demand-side management schemes, perhaps in the form of public-private partnerships, could present a vehicle for coordinating these coupling points in a cost-effective fashion. The report also leads to several central policy implications. First, if water consumption and withdrawal of power generation were monetized, the investment case for renewable energy would inevitably be a stronger one. Next, while reverse osmosis desalination plants limit the energy-intensity of water production, from an integrated systems perspective, multi-stage flash plants provide a coproduction functionality that may be preferred over individual reverse osmosis and power generation facilities. Third, while many water utilities across the region have made extensive efforts towards reducing water leakages, such efforts could be strengthened by considering the embedded energy and the associated economic and environmental cost of these leakages. Lastly, there exists both a necessity and opportunity to reduce the energy footprint of water supply in MENA countries through increased water recycling. Utilizing a decentralized treatment system providing multiple water qualities and treatment levels will allow more opportunities for recycled water use in industry, agriculture, and other areas. In all, the integrated energy-water nexus planning models and optimization programs presented and cited in this work provide deeper perspectives than their single product alternatives found in the existing literature. Their application in the policy domain has a high potential for future work and extension in the MENA region. Furthermore, these techniques have the potential for use in regions of similar climate (e.g. South-West United States & Australia) or other electricity-water utilities around the globe. In depth materials on LIINES energy-water nexus research can be found on the LIINES websitte. Good science is reproducible. This means that it must be publicly available, its contributions transparently communicated, and its data accessible. These are principles that drive the everyday work of every individual’s research at the LIINES. We now wish to go further and make a commitment to Open-Information. Sharing all input datasets used to conduct the research for which no prior proprietary or security commitments have been made. Producing scientific publications in such a way that scientific peers can accurately verify & validate the work. Making the content of all conference, journal and book-chapter publications freely available in author preprint form. (Note: Most publishers allow self-archiving and open-distribution of author preprints). We believe that the LIINES’ research has broad applicability to academia, industry, government and the public at large. However, traditional publication venues are often only subscribed by academic universities and a handful of well-funded industrial companies. All-too-often the people that can benefit from this work, never get a chance to see it. This slows down the work’s potential impact and is counter to the LIINES mission. It is for these reasons, that the LIINES makes its Open-Information commitment. While it is natural that making all of this information available will take some time, we will be sure to keep blogging to keep you up to date of new additions to the LIINES website. For now, feel free to visit the LIINES Datasets Repository which includes both data from our publications as well as a collation of several relevant and openly available datasets. In addition to its overall success, the IEEE Smart Cities Conference also presented significant research on the Energy-Water-Food Nexus. On Monday, a two-hour energy-water nexus special session was held featuring multiple aspects of LIINES research. The presentation entitled “Extending the Energy-Water Nexus Reference Architecture to the Sustainable Development of Agriculture, Industry & Commerce.” provided a high level overview of the types of couplings that exist not just within the energy and water infrastructure but also within end-uses in the agricultural, industrial, commercial, and residential sectors. Water and energy balance principles were used to systematically highlight the existence of trade-off decisions with the energy-water nexus. The presentation entitled “Extending the Utility Analysis and Integration Model at the Energy Water Nexus” featured LIINES research done in collaboration with the Water Environment Foundation (WEF). This work argued the need for integrated enterprise management systems within the water utility sector to support sustainable decision-making. The presentation entitled “The Role of Resource Efficient Decentralized Wastewater Treatment in Smart Cities” featured LIINES research done in collaboration with the German startup Ecoglobe. 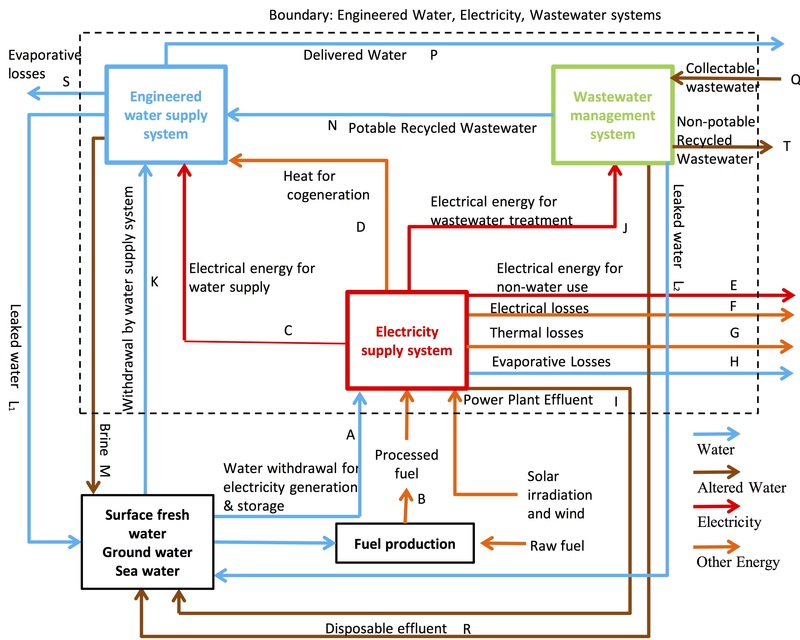 This work argued the need for resource-efficient decentralized wastewater treatment facilities as a key enabling technology in the energy-water-food nexus. It then presented Ecoglobe’s WaterbaseTM as such a technology. On Wednesday, a three hour workshop entitled “Smart Food at the University of Guadalajara (UDG)” was lead by Diana Romero and Prof. Victor Larios. It featured the university’s efforts to bring hydroponic farming to future cities. The workshop also highlighted the UDG’s collaboration with the MIT Media Laboratory’s City Farm Initiative. Both sessions drew participation of 40-50 conference attendees and active dialogue during the Q&A sessions. It is clear that a smart city — by all definitions — is one that actively manages the supply and demand for energy, water, and food as an integral activity. These two sessions demonstrated this need and looks to become a central theme within the IEEE Smart Cities Initiative and its flagship international conferences. Several days ago, we wrote a blog post to announce the beginning of the First IEEE Smart Cities Conference in Guadalajara, Mexico. Now that the conference draws to a close, we can firmly say that the conference by all measures has been a tremendous success. The conference had over 500 registered participants drawing from academia, industry, and government — fully in agreement with the triple-helix model of innovation. From industry, dozens attended from IBM and Intel alone. The conference also benefited from the presence of the Governor of Jalisco, The Honorable, Aristóteles Sandoval, as well as several generous industrial sponsors. The conference also distinguished itself for its focus on civic engagement, entrepreneurship, and innovation. Aside from the ample opportunity for networking and lively conversation, the conference featured a “Student Hackathon”. For two days, student teams were challenged to develop, in real-time, cloud-based Smart City Apps on iOS and Android platforms. The winning teams developed apps for smart transportation, healthcare, and community service and won monetary prizes of 500 & 1000USD. The LIINES wishes these teams all the best as they form small businesses to bring their apps to the market. With such participation, and despite the landfall of Hurricane Patricia only 24 hours earlier, it is clear that the First International IEEE Smart Cities Conference has established itself as a premier international conference and the flagship of the IEEE Smart Cities Initiative. Please do stay tuned for announcements for the 2nd International IEEE Smart Cities Conference to be held in the idyllic mountain city of Trento, Italy in September 2016. Interested readers can join the IEEE Smart City Initiative and its associated LinkedIn group. Here, at the LIINES, the concept of Smart Cities is one to which we have been paying attention for quite some time. Naturally, with the four research themes of Smart Power Grids, Energy-Water Nexus, Transportation-Electrification Systems, and Industrial Energy Management, we believe that the LIINES has a lot to contribute to the development of intelligent infrastructure in cities of the future. Prof. Amro M. Farid has been nominated to the IEEE Smart Cities Conference steering committee and also serves as the Workshop & Tutorials co-chair. He is also track chair for the Smart Grids track to be held all day today. Interested readers can join the IEEE Smart City Initiative and its associated LinkedIn group. Additionally, the conference organizers will be live-tweeting on Twitter #IEEESmartCities, #ISC2. Join us in the developing the Smart Cities of the Future. In a recent blogpost, we wrote how the LIINES is moving to Darmouth. Naturally, when a lab moves so does its website! The new LIINES website will now be found at http://engineering.dartmouth.edu/liines but will continue to be mirrored at the original MIT website (http://amfarid.scripts.mit.edu) in recognition of our continued collaborative research there. We look forward to updating the LIINES website to reflect the lab’s continued development. After four years at the Masdar Institute of Science and Technology, the Laboratory for Intelligent Integrated Networks of Engineering Systems is moving to the Thayer School of Engineering at Dartmouth! The move comes as Amro M. Farid assumes his new appointment as an Associate Professor of Engineering at the Thayer School. commits to three research areas; two of which include complex systems and energy. organizes itself as a single school of engineering rather than departments; thus enabling research and teaching in engineering systems. maintains a strong commitment to teaching; ranking first nationally for five out of the last 6 years. emphasizes the role of entrepreneurial innovation in engineering; truly embracing the “empowering your network” ethos. These efforts have lead to several notable outputs. In research publications, these include 17 journal papers since January 2014 with an average impact factor of 3.874, 2 books, 4 book chapters and 43 conference papers. In teaching, two new courses were developed ESM 501 System Architecture and ESM 616 Techno-Economic Analysis in Power System Operations. We are happy that students at the Masdar Institute consistently rated both of these courses highly. The LIINES has also increasingly taken on an international profile with active leadership in the IEEE Control Systems Society (CSS) Technical Committee on Smart Grids, the IEEE Systems, Man & Cybernetics (SMC) Society Technical Committee on Intelligent Industrial Systems, and the Council of Engineering System Universities (CESUN). Of course, the LIINES’s productivity is largely due to its students. And so this is also a moment to recognize their hard work and dedication. This began with the 2013 cohort Apoorva Santhosh, Reshma Francy, Reem Al Junaibi, Aramazd Muzhikyan continued to William Lubega in 2014 and more recently Deema Allan, Wester Schoonenberg, and Halima Abdulla. Thanks to the support of Prof. Kamal Youcef-Toumi, their MIT student colleagues Hussein Abdelhalim, Fang-Yu Liu, and Bo Jiang have also been instrumental in fostering a collaborative international atmosphere despite the time zone hurdles. Each of these students has made strong research contributions to the growth of the lab and have gone on to successful careers beyond graduation. Going forward, the LIINES will continue to work in the intelligent energy systems area as part of the Thayer School’s commitment to energy and complex systems. That said, the LIINES members at Masdar will remain as such and will continue their research in the spirit of international collaboration as their MIT student colleagues have done in the past. Dr. Toufic Mezher, Professor of Engineering Systems & Management has kindly agreed to coordinate the LIINES student members as they complete their degrees. Naturally, we will also continue to collaboration with the MIT Mechanical Engineering Department and more specifically Prof. Kamal Youcef-Toumi, the Mechatronics Research Laboratory and the Center for Clean Water & Energy. We’re looking forward to an exciting new 2015-16 academic year at the LIINES. Stay tuned for more! It’s been a long time since 2003 when the concept of the Internet of Things was first proposed by U. of Cambridge Auto-ID Laboratory. At the time, Dr. Amro M. Farid, now head of the Laboratory for Intelligent Integrated Networks of Engineering Systems, was a doctoral student investigating how RFID technology enabled intelligent products within reconfigurable manufacturing systems. The Internet of Things was being applied primarily in the manufacturing and supply chain domain. Since then, the Internet of Things concept has taken hold not just in manufacturing systems and supply chains but nearly every industrial system domain including energy. Every “thing” or “device” has the potential to be connected via an intelligent sensor so as to make decisions — be they centralized within an operations control center — or distributed amongst artificially intelligent multi-agent systems. The Internet of Things concept has the potential to fundamentally transform industrial systems. The LIINES is proud to have been working in this area since its inception and continue to do so. More information on our research can be found on the LIINES website. The LIINES is happy to announce that Applied Energy Journal has accepted our recent paper entitled: “Quantitative engineering systems modeling and analysis of the energy–water nexus” for publication. The paper is authored by William N. Lubega and Prof. Amro M. Farid. 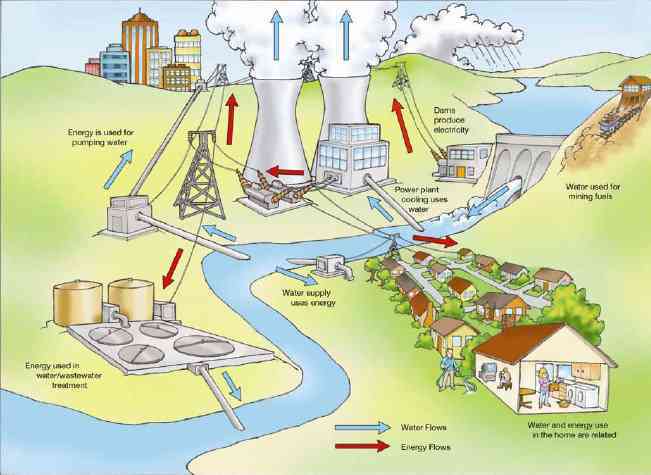 Electric power is required to extract, condition, convey, dispose of and recycle water for human use. At the same time, the bulk of global electricity generation capacity uses water as a heat sink or prime mover. This energy-water nexus is of growing importance due to increased demand for water and electricity; distortion of the temporal and spatial availability of fresh water due to climate change; as well as various drivers of more energy-intense water supply for example increased wastewater treatment requirements, and more water-intense electricity generation for example emissions control technologies at power plants. There are several notable published studies on this nexus. At a technology level, there have been attempts to optimize coupling points between the electricity and water systems to reduce the water-intensity of technologies in the former and the energy-intensity of technologies in the latter. Empirical determinations of the electricity-intensity of water technologies and the water-intensity of electricity technologies have been reported and analyzed. Various models that enable the exploration of the water resource implications of defined electricity sector development pathways and thus support the analysis of various water and electricity policies have also been developed. To our knowledge however, a transparent physics-based approach that interfaces a model of the electricity system to models of the municipal water and wastewater systems enabling an input-output analysis of these three systems in unison has not been presented. Such a modeling approach would support integrated control applications as well as integrated planning without a priori specification of development pathways, for example through optimization. A paper recently published by the LIINES in Applied Energy titled “Quantitative engineering systems modeling and analysis of the energy–water nexus” presents such a systems-of-system model. In this work, bond graphs are used to develop models that characterize the salient transmissions of matter and energy in and between the electricity, water and wastewater systems as identified in the reference architecture. Bond graphs, which are graphical representations of physical dynamic systems, were chosen as the modeling tool as they facilitate the inter-energy-domain modeling necessitated by the heterogeneous nature of the energy-water nexus. Furthermore they clearly identify causality and readily allow for model enhancement as required by applications. The developed models, when combined, make it possible to relate a region’s energy and municipal water consumption to the required water withdrawals in an input-output model. This paper builds on another LIINES publication entitled “A Reference Architecture for the Energy-Water Nexus” found in the IEEE Systems Journal. This research is of particular significance to countries in the Gulf Cooperation Council, all of which have limited fresh water resources and thus depend on energy-expensive desalination to meet a large portion of their water needs. This dependence enhances the degree of coupling between the electricity and water systems and thus the associated vulnerability concerns. Furthermore, motivated by the cogeneration of electric power and desalinated water, combined electricity and water authorities have been established in the region. The multi-energy domain model developed in this work is therefore of immediate relevance to the planning and control efforts of these existing institutions. William N. Lubega conducted this research in collaboration with his Master’s thesis advisor Prof. Amro M. Farid in LIINES at the Masdar Institute of Science & Technology Engineering Systems & Management Department. William is now a doctoral research assistant at the University of Illinois Urbana-Champaign Civil & Environmental Engineering department as part of the Energy-Water-Environment Sustainability Track. There, he continues his energy-water nexus research in the Stillwell Research Group. The LIINES is happy to announce that the Energy Journal has accepted our recent paper entitled: The Impact of Storage Facility Capacity and Ramping Capabilities on the Supply Side of the Energy-Water Nexus. The paper is authored by Apoorva Santhosh, Prof. Amro M. Farid and Prof. Kamal Youcef-Toumi. It builds upon an earlier publication entitled: Real-Time Economic Dispatch for the Supply Side of the Energy-Water Nexus which was summarized in an earlier blog post. As previous blog posts have discussed, the topic of the energy-water nexus is timely. In the Gulf Cooperation Council nations, it is of particular relevance because of the hot and arid climate. Water scarcity is further aggravated high energy demands for cooling. The GCC nations, however, have a tremendous opportunity in that they often operate their power and water infrastructure under a single operational entity. Furthermore, the presence of cogeneration facilities such as Multi-Stage Flash desalination facilities fundamentally couple the power and water grids. This paper expands upon the previously published economic dispatch problem to now include the impact of ramping rates and storage capacities. The latter is shown to alleviate binding production constraints and flatten production levels to achieve lower costs. Three cases studies are presented; a base case, a second case inspired by Singapore’s limited water storage availability, and a third case relevant to countries in the Middle East where water storage facilities can be readily constructed. Storage facilities are shown to reduce total operating costs by up to 38% and lead to less variable daily production suggesting that they have an important role to play in the optimization of the energy-water nexus.